Is a Consumer Proposal the same as Bankruptcy? Home » Blog » Is a Consumer Proposal the same as Bankruptcy? I hear it all the time: why bother going through a five year consumer proposal when you can just go bankrupt and be done with it? 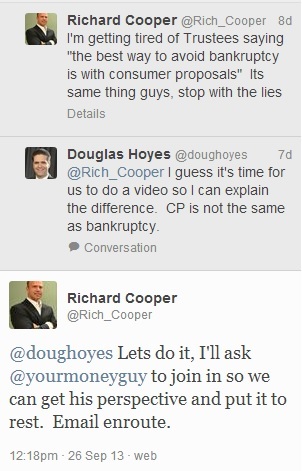 I don’t think Mr. Cooper was directing his tweet specifically at me (since I have never made that statement), but I took the bait and tweeted back that a consumer proposal is not the same as bankruptcy, so perhaps it was time to shoot a video so we could each explain our position. We wanted to include a mortgage broker in the discussion, so we picked a time, turned on our webcams and recorded our conversation on a Skype video call. FULL DISCLOSURE: I have known Richard Cooper for a few years, but we are not associated in any way. 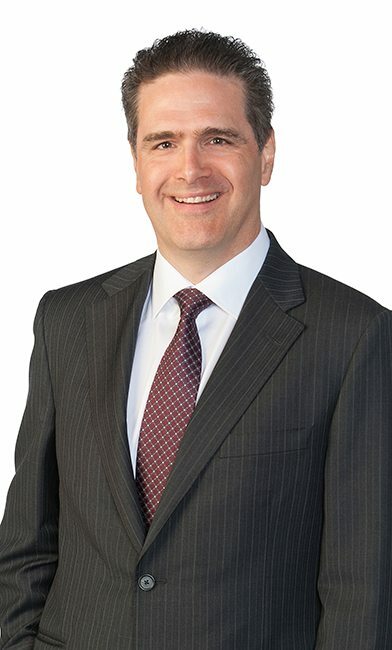 He runs a debt settlement company; my firm does consumer proposals and bankruptcies, and in my view in virtually all cases a consumer proposal is a better option than a debt settlement. For a debt settlement to eliminate all debts all creditors must agree; a consumer proposal is binding on all creditors if over 50% of the dollar value agree. CRA won’t accept debt settlements for less than the full amount owing, but they will accept consumer proposals for less than the full amount owing. Debt settlements will rarely stop a wage garnishment or eliminate a judgment; consumer proposals do. But I digress. 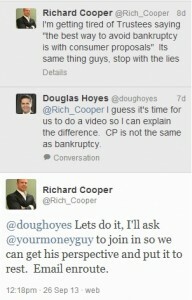 My point: just because we appear in a video together does not mean that I endorse Mr. Cooper, or that he endorses me. The third participant in the video was Elisseos Iriotakis, the Co-CEO of Safebridge Financial Group, a company specializing in mortgage centered financial planning. I had never met or spoken to Mr. Iriotakis prior to the day we shot this video. Here is my position: I agree that both a consumer proposal and a bankruptcy will have a negative impact on your credit. I agree that most mortgage lenders require you to wait two years from the end of your proposal or bankruptcy before they will grant you a mortgage. From the point of view of the lender, it’s the two years that matters. Whether it’s two years from the end of a bankruptcy or a proposal doesn’t matter. That’s why Richard Cooper says that consumer proposals and bankruptcy are “the same”. Fred (not his real name) owes $15,000 to CRA for back taxes from when he was self-employed, and they are garnisheeing his wages at his new job where he is now an employee for $1,000 per month. He also owes $35,000 on credit cards and other debts. His goal is to get out of debt, and buy a house some day. What should he do? Due to his surplus income his bankruptcy would be extended from 9 months to 21 months, and the cost could total $16,000 or more. Why more? Fred hopes to get a raise in a few months, and there is lots of overtime at the moment, so his surplus income could be even higher than calculated. Fred knew he owed the money, and didn’t want to go bankrupt. Sure enough, with the pressure of the garnishment and the other debts eliminated, after filing the proposal Fred was able to work a lot of overtime, and he managed to pay the proposal off in 18 months. He was used to having $1,000 per month in garnishments taken from his paycheque, so with the garnishment stopped, and with the extra overtime, Fred was able to pay $1,000 per month and pay off the proposal in 18 months. If Fred had gone bankrupt, he would have had to wait 21 months + 2 years before hoping to qualify for a mortgage. By paying off the proposal early, Fred only had to wait 18 months + 2 years. For Fred, the proposal was the correct option, and he was much happier having avoided bankruptcy. Is a proposal the right choice for everyone? No. Fred had a good job, and was able to work overtime. If he had lower income and no RESP or RRSP, the best option may have been a bankruptcy. If buying a house was not a goal, the two year condition required by mortgage lenders is not an issue. (A proposal is purged from your credit report three years after it is paid; Equifax purges a bankruptcy after six years, so in Fred’s case if he paid the proposal in two years the note is off his credit report in 5 years, which is much sooner than the almost 8 years in a bankruptcy. This matters for all borrowing other than a mortgage). In this video we discussed the case of someone who has debts today, and wants to buy a house in the future. If you have debts and currently own a house, a consumer proposal is an excellent option, because you can keep your home. Approximately one third of the people we help already own a home, so if you have some equity, but not enough to qualify to increase your mortgage, a consumer proposal is almost always a the best option. It’s better than bankruptcy, and much better than debt settlement in most cases. That was my point in the video: you are unique, so don’t assume that just because your friend picked Option A that Option A is right for you. Which option is best for you? Call us at 310-PLAN (no area code required) to set up a no charge, no obligation initial consultation, and we will explain all of your options so you can make an informed decision. Debt Settlement vs. Consumer Proposal: What’s the Difference? Is There Such Thing As A Typical Consumer Proposal?